The recent release of Terminator: Salvation – the fourth instalment in the long-running film franchise – has produced a flurry of articles from various professional websites attempting to compile a complete picture of the various time-travelling escapades that have been a central element of this fictional universe from the very beginning. While none of these have been completely free from error, all have done a fairly proficient job of imparting the major points in what has become an increasingly complex web of alternate timelines, circular causalities, and apparent paradoxes. What has consistently undermined the merits of these articles, however, is the underlying grasp of how the series construes the more fundamental nature of reality, which is most apparent when these articles attempt to represent the timeline visually. The following is an attempt to address this deficiency, relying not upon any real scientific understanding of the nature of time or physics, but instead drawing exclusively upon what has been presented within the series itself. Perhaps the greatest inhibiting factor against the appreciation of reality as the Terminator series presents it are the central conceits of that other great time-spanning Hollywood saga, the Back to the Future series. As they stand, the three current instalments in this popular franchise may be good, light-hearted entertainment, but the way they present the various effects of time-travel are largely nonsensical. An obvious example is found in Back to the Future: Part III, where Marty McFly – the protagonist in the series – discovers a tombstone commemorating the death of Doc – his friend, and inventor of the time machine – in 1885. The remainder of the film chronicles their efforts to find out how this occurred in order to prevent it from happening. One area where the film leaves credibility behind involves a photograph that Marty carries with him, featuring the tombstone, which is used as confirmation that Doc's out-of-timely death does not occur; once the precipitating events are dodged, we see to tombstone miraculously fade out of the image, which means that someone apparently felt the need to photograph a featureless patch of ground. If the tombstone can miraculously fade out of existence, shouldn't the photograph do the same? This is just one of many examples of how the issue of logical causality is glossed over, the most persistent of which is the fact that, no matter what changes occur to the timeline – even to the point where Marty himself is in imminent danger of fading out of existence – somehow the personal recollection of his own past is never altered. The reason I point this out is not to cast aspersions on the Back to the Future films, but to remove this influential depiction of time-travel from our consideration. Forget about people or objects fading out of existence. Reality in the Terminator universe is not some vast VHS tape that you can record over at various points without erasing the end. The first hint we are given of this comes from the quotation above, which is uttered by Kyle Reese – a soldier sent back from 2029 – in the original film, The Terminator. Particular emphasis should be placed on the term 'possible future' and the implications of 'your point of view'. Together, the suggestion is clearly that the perception of reality from an individual who has lived in a purely linear fashion – in this case the protagonist, Sarah Connor – are fundamentally different from those of an individual who has come back from a point in the future – both Kyle Reese and the T-800 terminator. To the former, the period between 1984 and 2029 is a limitless horizon of potential realisation, to the latter a single, definite sequence of events. As such, while use of the term 'timeline' is not technically incorrect in either case, it does promote a misleading connotation. 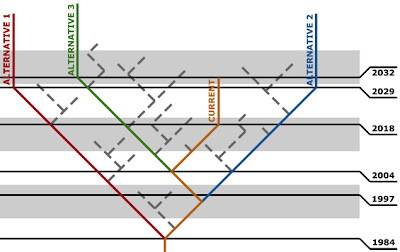 There certainly is a linear connection between past, present, and future, but this is not to say that the sequence is necessarily conforms to a straight line, nor indeed that there is only one. 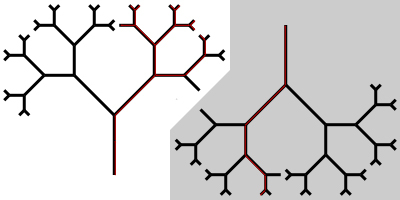 In fact, in order to adequately portray the complex potential realities demonstrated in the Terminator series, the only viable model would resemble a branching, segmented tree. The key to understanding this conceptual model lies in a rather simple analogy. Imagine that you are an ant standing next to an acorn. 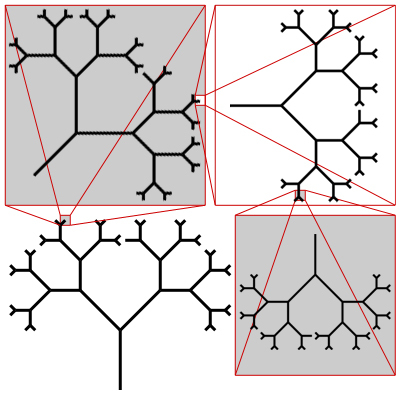 You know that this acorn will someday grow into an oak tree – limbs branching out and out, terminating with each individual leaf – but the idea that you would be able to predict precisely where any one, let alone all, of these junctions will occur is extremely unlikely. At this point the acorn seems to contain the potential to assume any one of an endless variety of eventual forms. Not only that, but your actions one way or another may hold the potential to influence its growth, the more so if the entire hive should exert their combined energy in pursuit of a common outcome. This is how the future appears to Sarah Connor, or indeed to all of us, proceeding through time in a steady, forward motion. Now imagine that you are an ant perched high upon a single leaf in a mature oak tree. The idea that the tree might not have grown to assume its current shape – with every little junction leading up to your current vantage – seems far less uncertain simply because, looking down, you can easily trace a continuous path all the way to the ground. If you had the means of propulsion, could might easily leave this particular extremity behind and travel down past several different junctions with other twigs and branches without ever having to change direction. This is how the past appears to us, but also how the period between 1984 and 2029 appears to Kyle Reese. This image below represents the fundamental difference between moving forward and backward through time: the left showing the normal, forward progression, the right the inverting effect of time-travel. Clearly, if you begin at a single fixed point toward the bottom of each model, the further toward the top you progress, the greater the potential divergence between the relative positions. The model on the left affords a greater number of potential avenues on the way to myriad, equally probable destinations, while the one on the right has only one prevailing course, making the route a certainty. This is the nature of reality in the Terminator universe, and this is the basic conceptual framework upon which the various timetravels within it fundamentally operate. The reality we are privy to throughout the four-film saga is not a straight line, but a single path along a tree that also features infinite other branches sprouting out of an infinite number of junctions along the way. The fact that those, such as Kyle Reese, who hail from a given point in the future can look back upon a single past is the result of an illusion, arising from the fact that their recollection is necessarily oblivious to the other potential realities that could, and do in fact, exist as well. In effect, each of the first three Terminator films depicts the meeting of one party travelling forward into the realm of indefinite potential futures, and another sent back from one of those potential futures to a definite point in their history, either with the goal of enacting some change or in order to prevent it. An inherent aspect of this process, building upon what we've established so far, is the realisation that no matter how much tampering in the past may be minimised, it is highly improbable that a traveller hailing from one future could ever see precisely that same reality play out again. This is due to the fact that any potential reality is constantly being shaped by the complex universal interactions that are occurring in any given instant. In this respect, any sequence of events and the attempt to incorporate them into a branching model is a gross over-simplification. The model is right, but the sheer frequency, scale, and complexity of everything that goes into shaping the future would be impossible for any depiction to ever adequately convey. For the sake of demonstration, however, let's imagine there being only two possible outcomes to any significant juncture in how reality may unfold, and that there were only ten such junctures between 1984 and the point from which Kyle Reese is sent back in 2029. Using the inverted tree model, no difficulty is incurred sending him to the correct point in the past. Once he arrives in 1984, however, and resumes the normal progression of everyday life, the ten junctures between then and 2029 now offer no less than 1,024 possible iterations of the future, giving him an objective 1/1024 chance of ever seeing the future, as he knows, it realised in identical form. Subjectively, of course, he could attempt to influence the progression of events in favour of reaching such an outcome, but this would require a detailed knowledge of every juncture and its significance, not to mention the fact that there are many more people who have no interest in aiming for such a future, in addition to a T-800 deployed specifically to make sure it doesn't. 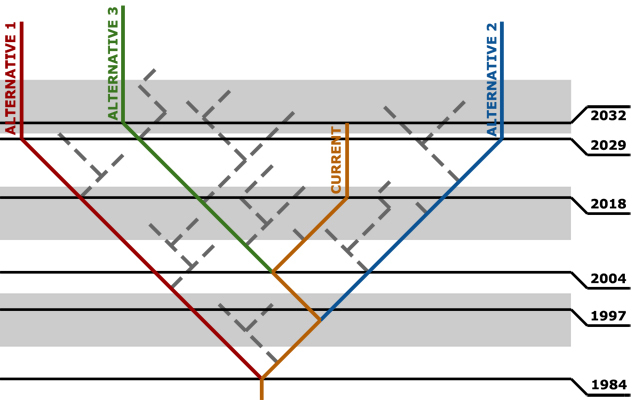 Taking into consideration all the points we've examined thus far, it is now possible to actually map the various divergences in the Terminator timeline. The potential future from which Kyle Reese and the T-800 hail. The potential future from which the T-800 and T-1000 hail. The potential future from which the T-850 and T-X hail. The potential futures of which nothing is known. Few lines of dialogue have caused as much contention and consternation amongst fans of the Terminator series as the one above. The ostensible reason for this is that it seems to openly contradict the emphasis on being able to change the future espoused in the first two films. Just as with the differing perceptions between Kyle Reese and Sarah Connor, however, this apparent fatalism is a matter of perspective. In fact, Terminator 3 has received a lot of unjust condemnation for rules that were established in the first two films, but which it is popularly thought to have broken. Actually there is no such contradiction, with the third instalment merely continuing the monumental change that was depicted in Terminator 2, where Judgement Day was seemingly averted. The eventuality which sees it merely postponed until 2004 is not some immutable force of predestination – which the word 'inevitable' is mistakenly interpreted as meaning – but the actual application of individual free will. The future is shaped by human endeavour, to the extent that our physical and mental resources allow. It just happens to be the case that a substantial collective will has been unwittingly set to the task of bringing about our destruction during the period between the end of the second film and the beginning of the third. This only reinforces the fact that it is not only the high-profile time-travelling events of the series that cause deviations in the unfurling of reality, but the influence of our day-to-day lives; such incursions from the potential futures simply throw the discrepancies between the now and the to-be into the greatest relief. As of the latest instalment, we are aware of at least three alternative futures, represented by each of the time-travelling insurgents from the first three films. and each interaction with with these insurgents actually served to bring about. What we have seen in the present, and now being played out in latest film, is the result of each interaction throwing the timeline into a new juncture, making four distinct courses in total. According to the reality portrayed in the Terminator series, all four of these outcomes are 'real' in the sense that they exist and play out with no objective precedence. The films, on the other hand, obviously place a subjective emphasis on the timeline which follows a particular incarnation of John Connor. This means that, as of Terminator: Salvation, we have a timeline that shares key remnants of at least three other divergent realities. And this is before we even begin to contemplate the myriad small and large deviations to be found in the television series, novels, comics, and videogames.